Speak Up, Speak Out, Whoever You Are! One of the lucky things that come with living abroad, is getting asked a countless number of times the question "Where are you from ? ", and getting to see people's reaction when you say "Lebanon". When you live in an international environment (in my case, Chalmers University in Göteborg), you also get to see a whole spectrum of reactions, ranging from the casual "Where is that ?" to the inevitable "Oh I hope the situation calms down soon over there"
Remember the very first episode of How I Met Your Mother ? Well to refresh your memory, it starts out with Barney announcing his newest discovery: Lebanese Women are Hot. I'm not complaining, and I do agree with Barney, but it just so happens that this particular episode brought on one my favorite reactions to the "Lebanon" answer, and that is "Oh, know any Lebanese chicks ?" Yes, a drastic change in angle I know, but here's how they match: I've had the chance to talk to many Iranians since I got here, and believe it or not, they were shocked when I told them Beirut has a very active nightlife. In fact, the only thing Iranians seem to hear about Lebanon, is in relation to the conflict with Israel, and related to Hizbullah. It seems Iranians see the Lebanese people as being almost like the Palestinians, constantly in conflict with Israel, and most importantly, very pious muslims, which means: no drinking, no dancing, no bikinis... you get the picture. Note: If you haven't been to Lebanon, you might have a hard time appreciating this irony. I feel we're staying too long on the issue of Lebanese women, but I'll try to keep this short and move on. I don't have anything against Haifa Wehbe, or any Haifa-type singer out there. However, since Lebanon seems to be the biggest exporter of Haifa-types, most of them funded by gulf investors, it kind of sets the image that this is our musical culture, or even culture in general. Yes, we are probably the most liberal country in the Middle East when it comes to women, but I can't help the feeling that mass exporting that kind of music is actually counter productive to equal rights movements across the middle east, and makes the country look like a giant brothel (obvious: it's not). A recent poll showed that 30% of women in Lebanon have had one or more plastic surgery operations. In fact, there is a trend called "Plastic Surgery Tourism" in Lebanon, where people from all over the world come to Lebanon to get a first class quality operation for a much cheaper price compared to what they would've paid back home. Women in Lebanon are increasingly looking fake and plastic, sometimes with outrageously sized lips and/or breasts. What that says about us as a nation, is first and foremost that we are a very shallow people, and that women have to have a certain standard of looks in order to get a job. Yes, women have a lot of freedom in Lebanon compared to neighboring countries, not enough compared to, say, Sweden, but when their rights are subjected to conditions on their looks, that is quite an issue, one we as a people should be quite ashamed of in fact. There's one thing you can be almost sure of, when you tell someone you come from an Arab country: The words Desert, Camel, Sand, Veil will very likely find their way into the next five minutes of conversation. On top of that, you can add every possible prejudice the world has about Arabs, and put it in the mix. You will find concepts that are proper to countries like Saudi Arabia assimilated to Lebanon. I'm not saying there's something wrong with Saudi Arabia, I'm saying there's something wrong with our image, if people think that life in Lebanon is similar to life in Saudi Arabia. Yes, both are Arab countries, but every Arab country has its own signature, and not conveying that message well enough, from our part and every other Arab country in fact, earns us the fact that we're all assimilated into every idiotic stereotype people link to the word Arab. On this one I say: We need a better PR department. 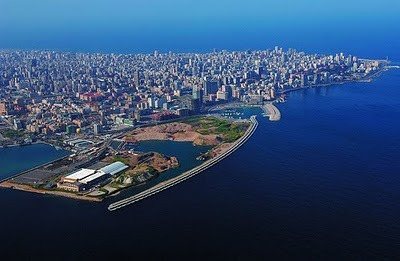 The world media sometimes insists on painting a distorted picture of Lebanon. Take for instance this picture here, which goes with an article about Hizbullah's new resistance museum entitled "Jihadi Tourism Hits Lebanon". 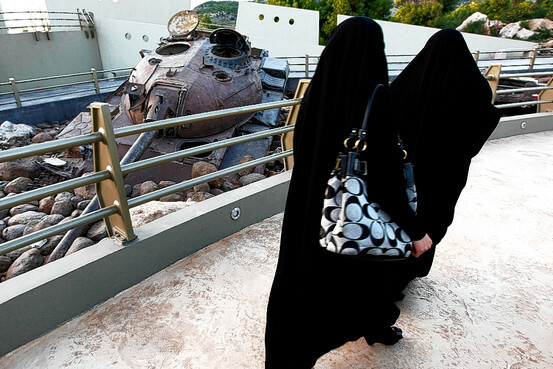 The image portrays women in Lebanon as fully veiled, while with all probability the two women depicted in the picture are Gulf tourists. You'd have to look pretty hard to find that kinda veil on a Lebanese woman. However, the aim of such a picture, is to draw Lebanon under a radical Islamic light, simply because women dressed in shorts and tank tops at a Hizbullah museum wouldn't send the same kind of hate-filled message. Finally, I have a bone to pick with Lebanese politicians. There might be a few exceptions out there, but most of our politicians don't represent a big chunk of the people, their hopes and dreams. To top it all off, they fight worse than toddlers. It's a wonder that anything is getting done in the country, when you see how much bickering goes on on the sidelines of politics. And yet the Lebanese people have so much potential, they can and actually do achieve great things. We need a better class of politicians, one that responds to our needs and elevates us as a nation, not one that appeals to the lowest common denominator and alienates the rest of us. There's a lot of work to be done, and frankly I wouldn't know where to start. But I think everyone has a part to take in this. If you feel you're being misrepresented, speak out, voice your opinion, don't just sit there on the couch complaining. There's a lot of work to be done, and maybe it should start with you. Take a good look at your life, and ask yourself: Are you part of the problem ? And how can you help ? Don't forget that the image of your country is the first thing non-Lebanese people see when meeting you, they won't care about your religion, which party you're affiliated to, or who worked on your body... They will see you as a Lebanese person, and that image, we all share it together, so let's work on it, together. But Fadi, I don't feel like people have a bad image of Lebanon. If anything, Lebanon gets away with a whole lot of things, when you look at this "image". Maybe I say that because I find that Lebanon seems to be doing quite alright image wise, and because i know that not-so-friendly-anymore look on the typical Franco-Lebanese Parisian's face when he finds out that, despite my perfect Lebanese accent, I'm Tunisian...The only solution to this, i think starts with ones cliches and prejudices about other countries. And in that sense, I think Lebanon does have work to do. Or is it okay to demand that occidental countries have a better image of us and at the same time perpetuate prejudice on countries considered as "below"?